Our first week of observations done, and we’ve already seen one copulation! Watching birds for hours on end at the Arboretum has actually proved to be quite enjoyable, due to the pleasant setting and perfect weather (apart from the fact that I’ve come down with a cold). This post, however, will be about Penelope. Smuggled into Canada by Charlie, resurrected by Vanya, and given wheels with Charlie’s help again (see picture of driving practice here), Penelope is a stuffed peahen that I’m hoping to use for some behavioural experiments. Although the experience was hilarious, I found Penelope’s overall performance to be lacking. She inspired far more curiosity than lust on the part of the two males tested so far. Both stared intently and moved a little closer, but didn’t make a move. This could be due at least three things: (i) the unusual appearance of her wheels, (ii) her abnormal plumage colour (she was an injured bird from a farm that breeds birds with colour mutations, so she doesn’t quite look like a normal peahen), or (iii) her lack of grace/movement. We gave her another chance without the motorized base and got the same result, but there’s still no way to distinguish between (ii) and (iii) at this point. I’m not giving up on Penelope yet. 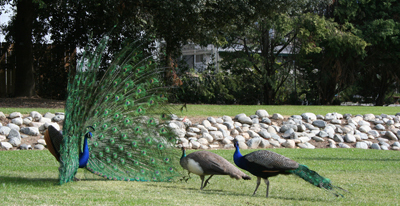 There were a lot of real, moving females around on that day, and the peacocks weren’t making any efforts towards them either . As the season progresses, the males should grow more restless (read: desperate), no doubt increasing her chance of success. Soon, the city will be mine and Vigo’s… mainly Vigo’s. My friend Adriana recently confessed to me that, while she was enjoying this site, she’d been “skimming over the science stuff no offense”. I would like to assure her that yes, we have taken advantage of our days off here as well. Early on, we had the good fortune of having a few visitors descend on Los Angeles from across North America: Charlie from Kingston, and Shiva and Paula driving all the way from Texas for President’s Day weekend. We saw the Getty museum and then went out for a ridiculously tasty dinner in Beverly Hills that, for the 5 of us, cost nearly what I make in a month as a grad student. At the table next to us, we noticed the Ghostbusters II actor quoted above – Jess I expect you to get this one without internet cheating! Last week Rob and I traveled to San Francisco for a couple of days. We had been working at catching birds for 11 days straight, since I thought it would make the most sense to exhaust ourselves with catching and then take an extended break, allowing the birds time to settle down before starting observations. Rob has family in Palo Alto just a short drive away from San Francisco, so we were very lucky to have warm beds and delicious meals provided. We spent one day visiting the Monterey Aquarium (an amazing place) and one day getting a taste of San Francisco (quite literally – we visited Golden Gate Park and went for clam chowder at the waterfront before heading home). San Francisco is a beautiful city. We drove around some of the residential areas, and the houses have a lot of ingenious ways of dealing with the steep hills. I’m going to go there for another short visit on my way home to Canada in April – hopefully I’ll have more time to explore! The peacocks here are fickle. Just when we think the good stuff is about to begin, we’ll have a day where all they want to do is sleep and eat. And it doesn’t seem to be based on the weather (at least not in any simple way), since the activity level has waxed and waned over the past week despite consistently warm clear days. The one thing we’re sure of is this: we arrived here just on the cusp of the breeding season (more or less perfect timing, although possibly a little too early). We didn’t see any males display their trains our first day, but as time wore on we saw a few opportunistic male dances (despite a lack of female interest). About a week in, we started to hear a lot more calling by males in the morning, and we saw a few more displays and a little male-male aggression. 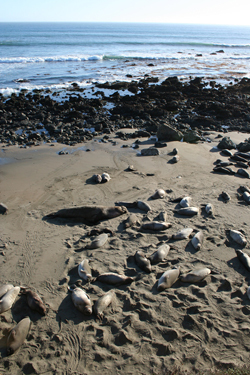 It seemed as though males were starting to establish their territories. Each morning, we’d notice them spreading a little further away from the ideal habitat around the park entrance and cafe. One morning this week we saw five males positioned strategically around the outskirts of a the big lawn to the north of the cafe, stationary but neither feeding nor resting (which certainly suggests territorial behaviour to me). The next day, a handful of new males had spread into the staff parking lot where we process captured birds. When we brought our first catch of the day back into the shady corner of the lot for processing, one of these new males started following us. A beggar, we initially thought, until he actually started trying to attack the bird Rob had in hand. Apparently the sight of male plumage is enough to provoke an attack even if it’s suspended above the ground under the arm of a giant! We’ve solved this problem by moving our sampling station and by having me chase away the odd interrupting bird (which sometimes ends in both of us running in circles). Most recently, we are starting to see a few males in regular territories but we still can’t tell what is going on with the bulk of them. Our strategy is to put all of our efforts into catching until the middle of next week. Then, we’ll head to San Francisco for a couple of days off and hope that things will settle down by the time we get back! The other day, we were back at the Arboretum in the afternoon to catch birds during the second active time for peafowl (the birds like to get things done in the early morning and late afternoon, with an extended siesta between noon and 4pm). Within minutes of arriving, we’d caught our first male, but didn’t finish processing him until about 5 pm. Sunset was approaching and I didn’t think we’d have enough daylight to nab another. I headed to the bathroom to wash the peablood off of my hands and Rob went to check on our most recent capture, with the understanding that we’d meet back at the car in a few minutes and head home. On my way back from the bathroom, Rob emerged from behind some shrubbery clutching yet another peacock, this one caught singlehandedly! As we raced to process this bird before sunset, Rob rather excitedly explained how he’d accomplished his feat. First, he grabbed the bird’s legs from behind as we normally do. Then, he spent a few moments calling out for me, and when he realized I wasn’t coming he sat and puzzled over what he had to do next: singlehandedly get the bird into the reverse position where he would be able to use his body to secure its wings without letting it go. While I’m still not too clear on the details, I can tell you this much: it involved kicking off his sandals and using his feet. 1. Lure them with food, fish nets at hand. Realize that peacocks, although desperately hungry and willing to come perilously close to human feeders, are not willing to present their backsides to you. Also realize that peacocks know what nets are, and are capable of learning which people are associated with food, and which are associated with nets. Begin to despair that peacocks are much better adapted than previously thought. 2. Decide that fish nets are far too inefficient. Dream up a design for a netted trap that lies flat on the ground (food placed in the middle) with handles at either end for peacock wranglers to hold. Trap has netted sides and a netted top that can be drawn closed by lines also held by the two wranglers. 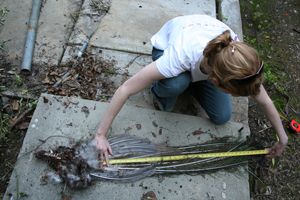 Once a bird is lured into the middle of the trap, wranglers can raise the net and pull it closed over the bird. Spend several days seeking out parts and building this trap using PVC piping and garden trellis netting in the junkyard behind the Arboretum green houses, only to find that peafowl are suspicious of the PVC piping and unwilling to step over it to get at the food in the centre. With a great deal of patience, manage to coax one male into the centre of the trap, but just barely miss catching him when the net is drawn closed too slowly. 3. Design two other traps: one snare for snagging the bastards’ feet with a line (complete with a pulley system to ensure extreme speed of snaring) and one remote-controlled caribiner (similarly intended to hook and grab the legs). Decide that the caribiner might present a high risk of leg injury. Discover that although the birds are wary of the snare, it can be more easily camouflaged and thus has potential. 4. After two near-captures with the snare one morning, spot a male displaying to the females who were drawn to the area by our snare bait (peanuts). Have one wrangler sneak up behind this extremely focused male in the throes of his display and grab his legs firmly from behind (note that person must overcome fear of projectile excrement first). Have the second wrangler swoop in to secure the wings. So far we’ve managed to catch 14 adult males here using technique no. 4… and much to my relief, we are starting to see the banded males regularly in certain areas around the park. If anyone has any more suggestions for how we might go about catching these birds I’d love to hear them! It’s hard to believe I’ve been in Los Angeles for two weeks now. 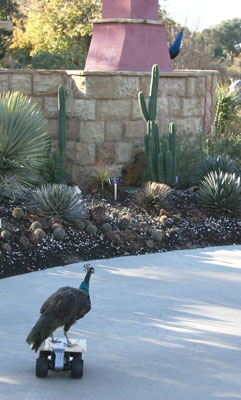 Time flies when you’re trying to outsmart wily peafowl. The best way to describe my experiences here so far would be (consistent with my history): extremely lucky. Last fall I had managed to find a furnished room for rent at a ridiculously low rate just a couple of miles from the Arboretum, but had no idea what to expect since my contact with the landlord was limited to email. When Rob and I arrived in town two weeks ago, directions in hand, we drove past a number of elaborate looking houses on the way to our rental accommodations. As we passed gated lawns adorned with fountains and statues with our destination just blocks away we were getting quite excited. Our house, it turns out, is rather modest for the neighbourhood. Our landlord, Shih, teaches math at a local high school. She is, as Rob describes, an alarm-system enthusiast and also a collector of old newspapers and other bizarre items that fill every available cupboard and surface in our bedroom. Luckily for us she is also quite a wonderful lady; she’s fed us several times, given us gifts of crackers and towels and even granted Rob responsibility for household affairs when she went away for a few days last week. Our luck continued as we started our first day of work at the Los Angeles Arboretum – it may be the most idyllic place to work on peafowl conceivable. 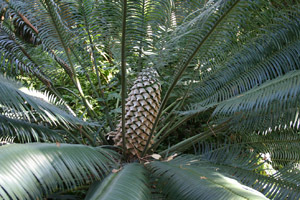 The park is full of interesting gardens and trees of exotic proportions, including some positively prehistoric looking cycads, a bamboo forest full of hidden treasures, and an orange grove (and I can assure you that the fruit is delicious). Visitors are encouraged to venture away from the paths, and when you do you often come across park benches nestled in shady out-of-the-way places that you wouldn’t have noticed otherwise. It is exactly the kind of place where I would love to bring a book and spend the entire day reading outside. We also saw a great deal of peafowl the first day at the Arboretum- and learned from the park director that these birds are descended from two pairs imported into the area by Arcadia’s founder (J. ‘Lucky’ Baldwin) a century ago. The population has grown to over 200 and is now spread throughout the residential neighbourhoods surrounding the Arboretum. While the birds apparently range quite widely for most of the year, they descend upon the Arboretum at the start of every breeding season (which, as it turns out, is exactly now) as it provides a safe-haven for lekking. Driving around Arcadia, you can’t help but notice evidence of peafowl as the official city mascot everywhere – from the stylized peacock that adorns all of the Arcadia street signs and the small park next door to our house, to the logos for the Arcadia chamber of commerce and golf course, to the giant peacock fountain in the large central city park, to (most hilariously) a massive peacock stained glass window over the door of one Arcadia mansion. We spent some time exploring the residential neighbourhoods around the park, and saw plenty of peafowl lazing on the well-groomed lawns and idly crossing the streets (Arcadia has even published a pamphlet explaining how to live in harmony with these beasts, here). Unfortunately, we can’t access the suburban birds for sampling because feeding and catching peafowl is prohibited under Arcadia bylaws. However, we’ve been granted free reign of the birds on the private park property, and I’ll write more about our efforts with them soon! On Wednesday morning I rolled out of bed at 5:45 am (not as difficult for me as you might think) to drive to the Bronx Zoo for a brief visit. I’ve been corresponding with the curator of birds there for some time. She had approved my research proposal this fall and wanted me to see the peafowl and the layout of the zoo, to decide whether sampling the birds there would be feasible. Unfortunately for me I had no idea when we arranged this visit that Wednesday would bring a terrible snow/freezing rain/wind storm to upstate New York. I also had no idea that Americans are so terrible at keeping their roads salted; as soon as I crossed the border the roads went from pleasantly wet to treacherous and covered in solid sheets of ice. Happily for me there weren’t many cars on the road or I surely would have gotten in at least one accident; less happily, the drive from the border to Syracuse (normally 1.5 hours) took about 3. I had arranged to meet Chris Sheppard (the curator) at 2 or 3 pm so that she could show me around the zoo before taking me to the ‘Tree Tops’ apartment, the accommodations for researchers on the zoo grounds where I would spend the night. Already running behind due to ice, I hit heavy traffic coming into the Bronx on the George Washington Bridge (making a 6 hour drive take 9, but feel like 12). And so, when I arrived at the zoo at 5 pm it was of course closed: the sun was setting, staff were leaving, and the rather high-strung security guard at the gate had no idea what to do with me. Already tired, nervous and frustrated about being so late, it didn’t help my state of mind that he sent me into the park shouting bizarre instructions to “only talk to Mary Evans”, implying to me that I’d be in serious danger if I spoke to anyone lurking about who wasn’t Mary Evans. Unable to find Mary Evans, I was quite close to giving up and going to find a hotel in Connecticut when I ran into a lady who turned out to be the head of education at the zoo. She gave me some directions and the entry code to the Zoo administrative buildings (!) where eventually I managed to get in touch with Chris Sheppard, and find out how to get to Tree Tops. This is honestly the first time I’ve ever really thought I needed a cell phone (but in retrospect, if I had only taken someone along with me on the trip I probably would have had access to one). The birds had learned that the green truck = food, as they started approaching it even before we began to feed them. Hopefully we can exploit this in California. There are two kinds of nets we could use to catch them: a fine-meshed net would likely be most humane, but for difficult birds we might want to use what Mark called a “tangler”. The Bronx males frequently attack shiny vehicles and mirrored objects quite viciously. I had heard of similar things before in news stories like this one from last year, but didn’t know how common they were (note that peacocks can also be on the receiving end of attacks). Another amusing tidbit is that the zoo has place 3 reflective spheres in Astor court in an attempt to attract peacocks, with the idea of making the lawn more beautiful for visitors. Instead, they ended up with one male who hangs out there and habitually injures his feet while attacking the spheres, leaving blood on them, and a bunch of children with burned fingers in the summer. Peafowl LOVE peanuts, even in the shell. They literally come running for them. After this excitement, I returned to the zoo administrative buildings to meet with Chris and a few of the other curators to discuss how feasible it would be for me to catch/observe the Bronx birds given the accessibility of their favourite places. I was left with the feeling that unbeknownst to me this meeting was actually an interview; the use of words like “corpuscular” being one clue. In any case, I think I passed, since the curators seemed quite positive and excited about the prospects for future peafowl research. It doesn’t take an expert to realize that the extravagant song, dance and plumage of male birds (see videos in my last post) are intended as some sort of communication to potential mates. However, the insight that sexual ornaments are signals was a critical one that provided a mechanism for sexual selection and vindicated one of Darwin’s most important ideas. Darwin, of course, was the first to point out that extravagant male traits persist despite their probable costs because females prefer them. 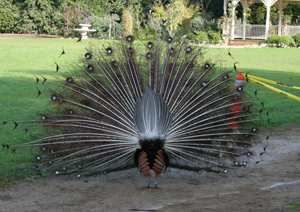 The example Darwin often referred to is the enormous and flashy tail of the male peacock (you can see for yourself at this online collection of all of Darwin’s writings). It wasn’t until the 1970s when Amotz Zahavi suggested his handicap principle that we really began to understand why females prefer certain males. Zahavi’s idea was that extravagant sexual ornaments should be thought of as signals, and these signals are not selected in spite of their costliness but because of their costliness. A costly signal is an honest one; only the highest quality males can express it to its fullest extent. Females should be selected to prefer traits that are costly for males to produce because preference for an honest signal should yield the most benefits. Preference for a dishonest signal (one that a low-quality male could fake) should be weeded out by natural selection. Darwinians had to wait a long time for honest signaling theory, and they had to wait even longer for someone to test these ideas with respect to the peacock. In the late 1980s and early Marion Petrie began to study what peahens actually look for in a mate. 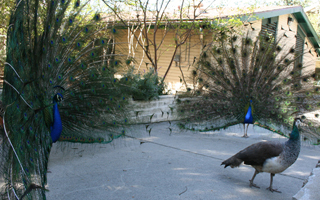 Following the love lives of peafowl in a London zoo, Petrie found a correlation between the number of eye-spots on a male tail and the number of peahens willing to mate with him. Petrie’s next step was to test this correlation experimentally by decreasing the number of eye-spots on the tails of some males (by simply cutting them off). 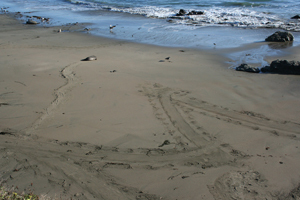 The question was whether the number of eye-spots directly influences mating success. Her results? Males who had eyespots removed were significantly worse off in terms of their number of mates compared with their mating success in the previous year. Petrie also looked at the quality of peacock offspring, and found that the larger the eye-spots of a peacock dad, the better his offspring survive, suggesting that males with more extravagant tails are high quality individuals. This means that peahens gain a genetic benefit for their offspring by mating with well-plumed males. 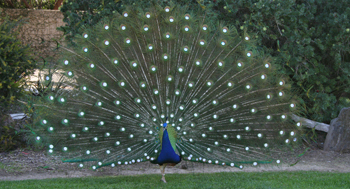 So the tail of the peacock would appear to be an honest signal of male quality rather than an arbitrary preference after all. One other intriguing result of the work done by Petrie and her colleagues is that peacocks tend to display close to their kin. This suggests that kin selection has shaped males to aid their kin in attracting more females, and may provide a reason why poor-quality males who don’t get any mates bother to display at all. 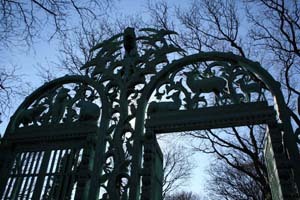 Interestingly, experimental work has shown that peacocks are able to recognize their brothers even when they do not hatch from the same nest. My question is: is it possible that birds might use some sort of visual cues that involve plumage for kin recognition?